This is my Dear Jane block G-7, Indianapolis. Sometimes when doing these blocks, you get one that is very “fiddly.” This is such a block, at least for me. 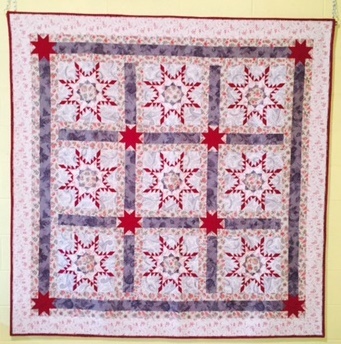 Don’t look at the piecing… if you do, you’ll say, “Wow, she sure didn’t line up her seams very well.” I tried. Inbetween watching the Democratic Convention and taking a good powerwalk around the neighborhood, I fiddled this block to death. I would either kill it, or it would kill me. I won. When it blends in with the rest of the blocks in the finished quilt, I don’t think you’ll even notice it. Please keep your thoughts to yourself. Great block!! 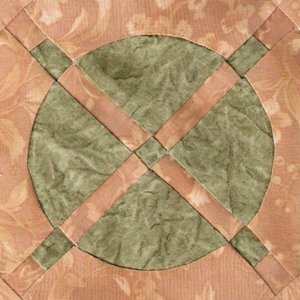 This is the block I want to do, but no clue how to start–even with Brenda’s tips! I agree with previous post! I just keep looking at the pattern and thinking how the h**k do I do this. You’re a brave lady getting to grips with it and a lovely job you’ve made too.